4:30am - Max tells Steph they should leave now and elope. Inside, Max and Steph are frantically packing their bags. Summer and Boyd look on sleepily. BOYD: You do realise what time it is? SUMMER: This is great. What?…Now? SUMMER: Oh no, your dress…it's still at Lyn's! STEPH: Oh yeah, good point. MAX: Yeah, why not just wear what you feel comfortable in? BOYD: Hey does that mean I get to wear shorts? Summer jumps around: Yes! Yes! Yes! Izzy and Karl are discussing the wedding Izzy says it's not fair that Lou has to miss the wedding. Karl says he'd like to miss it so he doesn't have to run into Susan and Tom. Izzy asks if he's jealous. Karl says he's not, it's just strange. Izzy says that with Susan and Lyn not getting on and she'd be surprised if Susan is there. Karl promises not to spoil the party. IZZY: Good then you can get in some practice. KARL: Well I gotta say I'm in a state of shock… You hide your age so well! Izzy says they should have a party – one last hurrah. Karl says he's not at the last hurrah stage. Izzy says soon he'll want to retire, see the world, buy a house in the country and she thought she'd remind him before he's old and senile. Karl says he just wants something low key. IZZY: Ok, a slap up with sardines on toast and a ceremonial changing of the denture pads. Karl says not unless he's in bed by nine. Libby and Susan are trying to finish wrapping their wedding gifts. Tom is looking on in amusement. Tom tries to hide his laughter. SUSAN: Hey, that's enough out of the peanut gallery thank you very much. Every guest wants to think they have bought the best-wrapped present – The Best! TOM: So what you're saying, it's not what's in the box, it's how you wrapped it that counts? LIBBY: No. It's about making everybody else's look cheap! Libby goes to get more ribbon. Susan and Tom discuss the wedding with Susan saying she loves wedding. Tom is worried as usually he's the one conducting the ceremony. Susan assures him everyone will be watching Max and Steph. Susan admits to Tom she's a little sad that she's not spending the morning with Lyn and sharing her excitement. Susan says she loves weddings. Tom says he's worried about today as normally he'd be conducting the ceremony. Susan says everyone will be watching Max and Steph not them. Susan says she's a bit sad she's not spending the morning with Lyn and sharing the excitement with her. Libby comes running back in with a roll of pink ribbon. SUSAN: Oh, wonderful. Hot pink's so Max! Max, Steph and Boyd are sitting at a picnic table eating burgers for breakfast. Steph says it's the perfect wedding breakfast. Summer is fiddling around in the back of the car. Max calls her over saying her burger is getting cold and being eyed off by Boyd. Summer runs over with her hands behind her back asking them if they remembered the camera. Everyone says no. Summer says she did and takes a photo of Max and Steph. STEPH: Mum will kill me if I didn't at least have photographic evidence. Summer says as bridesmaid and official photographer she'll take lots of picture for Lyn and Valda. Lyn is complaining that toady of all days she has big bags under her eyes. Valda says she has the whole set of luggage. Valda says she couldn't sleep as she had nightmares about the wedding cake. Lyn has prepared a big breakfast for Steph. She goes to take Steph her breakfast and screams out “STEPH”.Lyn comes running back into the kitchen saying that Steph's bed hasn't look slept in. Valda tells Lyn Steph is probably just in the bathroom. Jack and Charlie come out and Jack looks at Charlie and tells them not to got into the bathroom for a while. Valda tells Jack that Steph has vanished. Jack tells them that all the wedding madness has probably sent her packing. Lyn runs to the phone to ring Steph. Max, Steph, Boyd and Summer are still in the park eating when Steph's phone rings. She looks and it says “mum”. Everyone looks at each other. STEPH: I didn't hear anything…did you? STEPH: Mum please don't be upset. Max and I just had a little change in plans for the wedding, that's all. Lyn is shouting down the phone: That's all?! Stephy what do you mean? You know today has to run like clockwork. For heaven sake, everything has to got exactly to schedule. What do you mean change of plans? Steph puts the phone down on the table as Lyn is still screaming. Sindi is trying to decide what to wear. Toadie isn't paying attention. She tells him it's really important, as she doesn't want to clash with the bridal party or outshine the bride. She tells Toadie they should co-ordinate. Sindi says it's just one day but Toadie says it's three years. He has to prepare an appeal. He tells Sindi she can go without him. She says it won't be as much fun if he isn't there. Lyn is in tears: How could she do this? After all the arrangements and hard work. I just want to give her a fairytale wedding. Lyn says it's the sort of wedding she would have wanted. Jack sits down and starts eating the breakfast that was made for Steph. Jack tells them that's why Steph did the dash and the day they start planning his parties is the day the music dies. Valda and Lyn says they've overdone it. Charlie adds that he could of told them that if they'd let him get s a word in. Lyn starts crying more: Look what we've gone and done. Now she's made her own plans and they don't include us. Valda says she's only rejected the day they were planning. She hasn't rejected her family and friends. Valda asks Lyn is Steph said where she was going. Lyn says a little country town and they were going to get a celebrant. Lyn bursts into tears again. Valda tells Jack to ring Joe and tells him about the change in plans. She tells Charlie to get a map book and Lyn to get dressed. Steph and Max turn up on the doorstep off the marriage celebrant. He comes out in his pyjamas. MAX: Yeah, no look, we didn't just decide to get married last night. CELEBRANT: Right. You do know it's 7:30 in the morning don't you? Steph looks at Max's watch: Oh … wow… it seems so much later. MAX: I guess that's what happens when you've been up since 4 o'clock. In the car, Boyd and Summer are waiting for Max and Steph. Summer opens the car door then shuts it again. Her dress gets caught in the door. She tells Boyd she was going to get some flowers for Steph but thinks he should do it incase she hurts herself. Summer moves and her dress rips. SUMMER: No, this is way better than great. This is my third bit of bad luck. The worst is over. I can relax now! SUMMER: He's agreed to marry you? CELEBRANT:(coming over) You've got to have witnesses. He looks at Boyd and Summer. CELEBRANT: Well, they've go to be over 18. It's alright…I'll ring around. Boyd and Summer look excited. Steph and Max kiss. 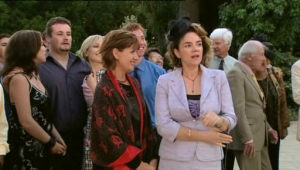 Sindi tells Toadie that Libby just called saying the wedding plans have changed, not that he'd be worried though. Toadie says he'd like to but he's up to his neck in it. Sindi says she can see that then points out he's been on the same paragraph for the last half-hour. Toadie says he's been reading other stuff too and making mental notes. 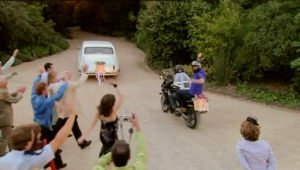 SINDI: Toadie I'm not unaware that this is the first wedding you've been to since your own. SINDI: Then what is it about? TOADIE: I love you but if I go to the wedding I can't guarantee how I'm gonna feel and what's going to come up and I just think that's really unfair to you. So I figure the best thing to do is not to go. SINDI: That is the loveliest thing that you've ever said to me. TOADIE: So are you happy to go on your own? The celebrant and Max are walking in front followed by the witnesses followed by Steph, Summer and Boyd. CELEBRANT: I'm sure you'll love the place I've picked out for you for this wedding. I do all my weddings here. I think the combination of nature and love, it's absolutely irresistible. Steph sees the rip in Summer dress. SUMMER: Nah, I don't mind. Not at all. Summer hands Steph a bunch of flowers: These are for you. BOYD: Watch it I think I see a redback. Steph drops the flowers, Summer screams. Max walks over to Steph. MAX: Alright the witnesses are ready to go. We've got the local butcher and the town baker. STEPH: What no candlestick maker? MAX: No, he shut up shop and left a few years back. Apparently business slumped when they introduced electricity. CELEBRANT: Perhaps we can make a start? Mr Morton's expecting a delivery of livestock this morning. MAX:(to Steph) Oh well, we don't want to hold up the wheels of commerce do we? Max and Steph hold hands and look at each other. CELEBRANT: Perhaps we should take up our positions. Max and Steph just stand there looking at each other. They stand in front of the Celebrant with Summer next to Steph and Boyd next to Max. CELEBRANT: Now before we start is there anything in particular you want me to put in the ceremony? Boyd shakes his head, Summer smiles. Steph takes Max's hand: No, No I've got everything I need right here. STEPH: What are you doing here? LYN: Oh sweet heart. You think I'd let you get married without me? I'm sorry I didn't listen to you. Valda runs up out of breath. VALDA: We're not too late are we? MAX: Too late for what? VALDA: Oh good. Come one everyone. Come on. We've found them. Karl, Izzy, Susan, Tom, Libby, Darren, Toadie, Sindi, Sky all come running up. LYN: To give you the wedding that you both wanted. You no, just relaxed and intimate. Like, no doves lying out of cakes, no string quartets. That's if you'll have us? Steph and Max look at each other and smile. STEPH: There's nothing we want more. VALDA: I'm going to cry now! MAX: Could you just hold on Valda. At least until we exchange vows. MAX: Alright everyone just pull up a patch of dirt. Go on, in you come. I have a beautiful woman I'm going to marry sometime today. LYN: Steph I know you want everything to go exactly as you want it and that's fine, that's fine. There's just one special favour I'd like you to do for me. I'd like you to wear something special, just for me? They cut to Steph and Max standing in front of the Celebrant. Steph has a veil on. CELEBRANT: Alright. If we're all ready now we might finally begin. STEPH: Max, when my life was dark you brought me light. MAX: Steph where there was cold you brought me warmth. CELEBRANT: If anyone objects to this unions you should speak now or forever hold your peace. Everyone looks around. Max and Steph look at Valda. CELEBRANT: Can we have the best man please. We'll begin the exchange of the rings. SUMMER: Oh yeah. Sorry I just wanted to know what it felt like. Sorry. CELEBRANT: Right. Now, do you Max take Stephanie to be your wife? Max puts the ring on Steph's ringer and then kisses it. CELEBRANT: And Stephanie, do you take Max to be your husband? Max and Steph kiss. Everyone gets up, cheers and congratulates them. All the guests are sitting back on their blankets. BOYD: Well apparently I'm supposed to crack a few jokes but apart from Steph's wedding outfit I couldn't think of any but that's just it you know. Steph's a one-off. No one like her. No one that can make my dad happy the way she does and I feel honoured to welcome her to our family. Dad, I know the last few years have been tough on you and I know I don't say this enough but.. I love you man and if anyone deserves a happy ending it's you. It cuts to everyone standing around talking and drinking champagne. Jack has the video camera capturing every moment. Valda is on her mobile canceling the wedding she and Lyn booked. CHARLIE: I doesn't have to be. 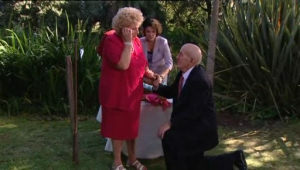 Charlie gets down on one knee. VALDA: What are you doing? What are you doing? Get up. Somebody help him up, somebody help him up. His knee's gone bung! CHARLIE: Valda Sheergold.. will you let me make up for the lousy, rotten, stinking thing I did all those years ago. I want to marry you if you'll have me and forgive me. Second time around we might get it right. You're gorgeous. Lyn and Steph walk Valda down the aisle. Steph still has her veil on. Valda and Charlie exchange vows. When it comes time for the rings. Lyn takes hers off and gives them the Celebrant. FEMALE CELEBRANT: I now pronounce you husband and wife. It cuts to Steph and Valda about to throw Valda's bouquet. BOYD: Now remember ladies No spitting, no biting, no scratching. We want a fair match here today. Darren pushes Libby forward and Boyd is pushing Sky. Steph and Valda throw the bouquet. Libby catches it. Valda and Charlie get into the bridal car. Lyn hugs Steph goodbye. Izzy hugs Max and then Steph. MAX: (to Valda and Charlie) Don't do anything we wouldn't do! Valda and Charlie drive off. Hiding behind the car is a motorbike. Steph squeals again and jumps into Max's arms. Everyone is watching them. 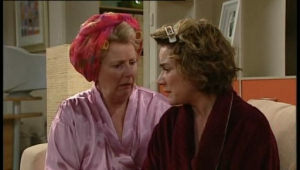 Susan walks up to Lyn. SUSAN: It was a lovely day. You must be very proud. LYN: Yeah, well I am. I'm glad you made it along Susan. Tom walks up to them. Lyn looks at him them looks away. Max and Steph ride off with everyone waving after them.